Quotations about American West. Quotes to stimulate mind and drive action! Use the words and quote images to feed your brain inspiring things daily! I think we have powerful role-models among us in the American West. Certainly the Hopis, a timeless civilization that understands sustainability and what that means about living in harmony, in tandem with the natural world. We have much to learn from them, and they will survive us, I feel certain about that. 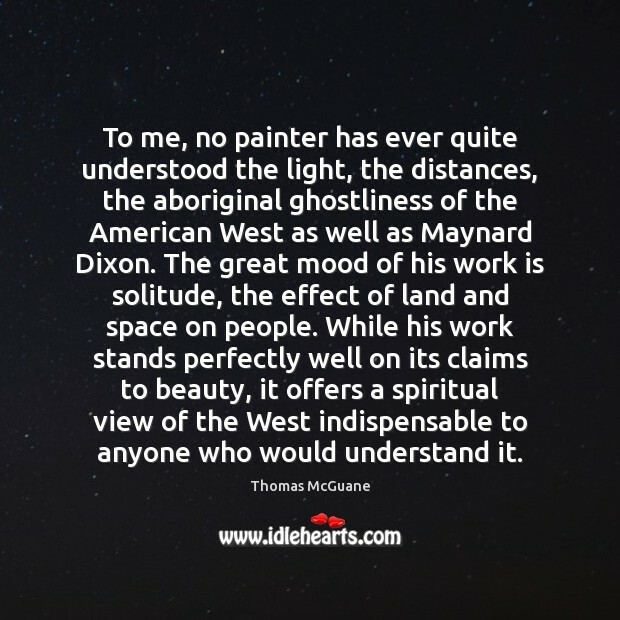 To me, no painter has ever quite understood the light, the distances, the aboriginal ghostliness of the American West as well as Maynard Dixon. The great mood of his work is solitude, the effect of land and space on people. While his work stands perfectly well on its claims to beauty, it offers a spiritual view of the West indispensable to anyone who would understand it. 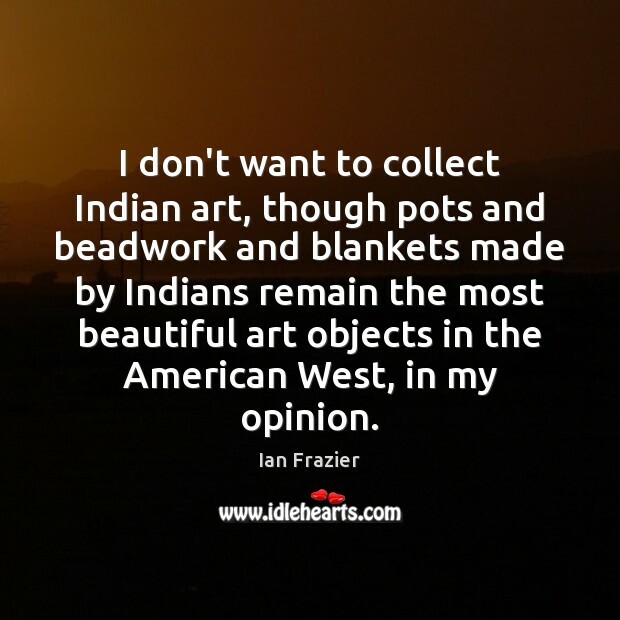 I don't want to collect Indian art, though pots and beadwork and blankets made by Indians remain the most beautiful art objects in the American West, in my opinion. I read a lot of fantasy. I adored 'Anne of Green Gables'. 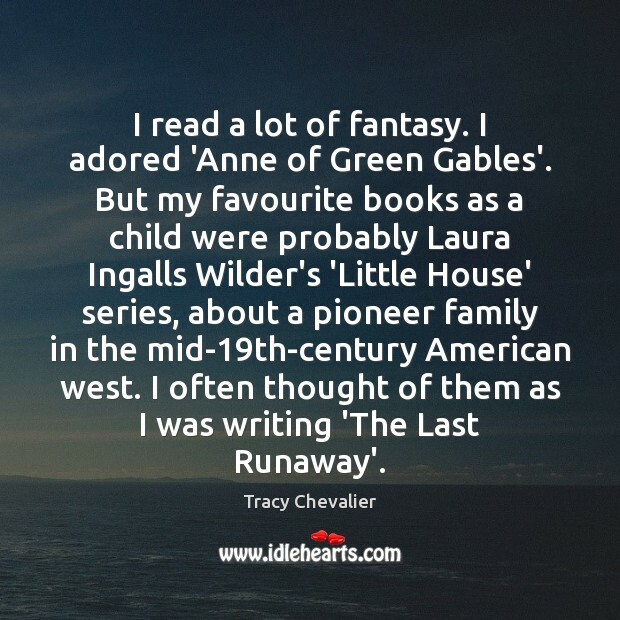 But my favourite books as a child were probably Laura Ingalls Wilder's 'Little House' series, about a pioneer family in the mid-19th-century American west. I often thought of them as I was writing 'The Last Runaway'. What opened up the American West was the fact that you owned the real estate. You owned the gold mines, the oil wells. The creation of these, back then, million dollar industries drove the railroads and eventually the airlines to provide this kind of transportation. 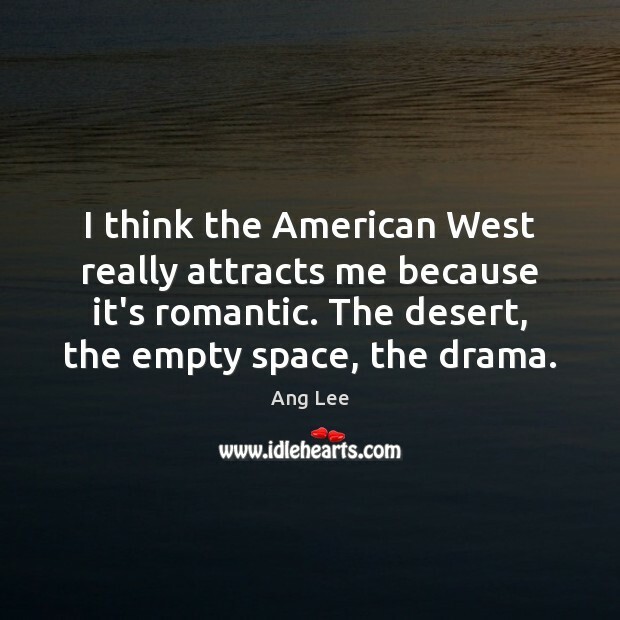 I think the American West really attracts me because it's romantic. The desert, the empty space, the drama. There are certain things we can only do together. There are certain things only a union can do. 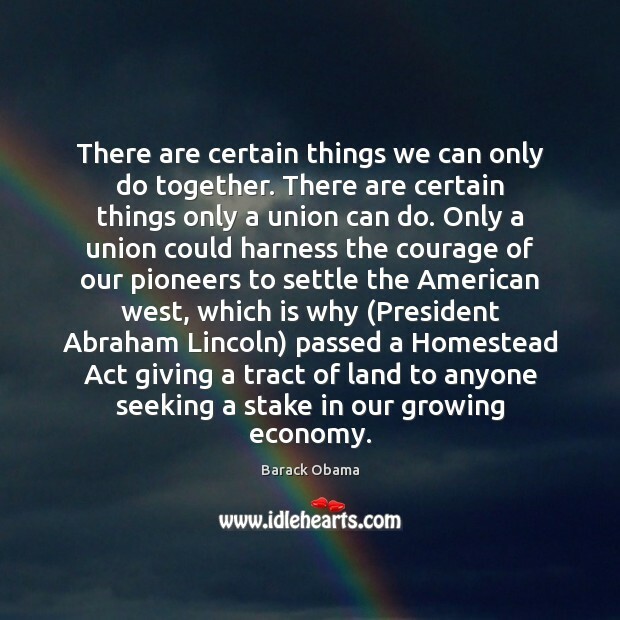 Only a union could harness the courage of our pioneers to settle the American west, which is why (President Abraham Lincoln) passed a Homestead Act giving a tract of land to anyone seeking a stake in our growing economy. 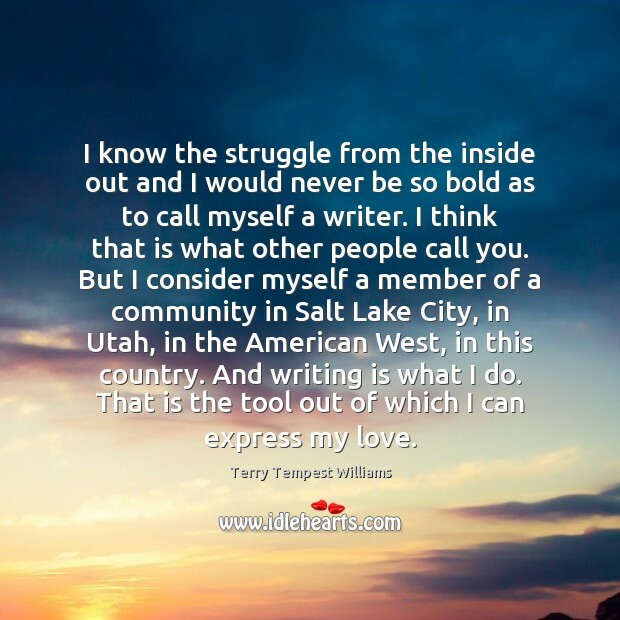 I know the struggle from the inside out and I would never be so bold as to call myself a writer. I think that is what other people call you. But I consider myself a member of a community in Salt Lake City, in Utah, in the American West, in this country. And writing is what I do. That is the tool out of which I can express my love. 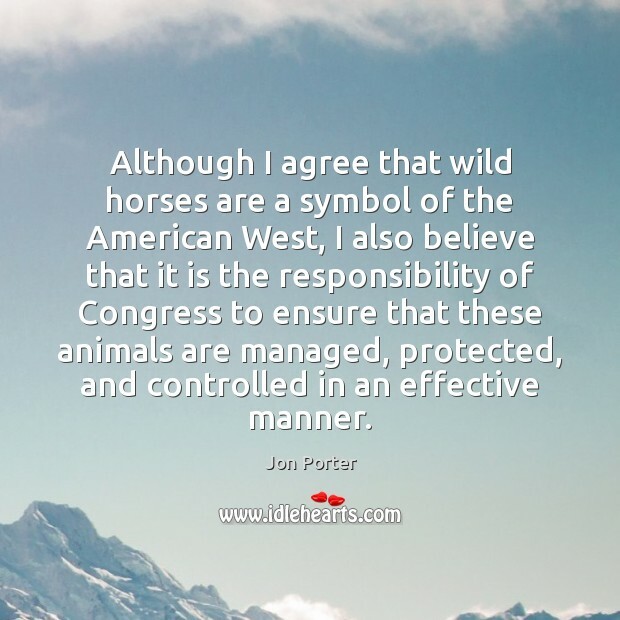 The preservation of parks, wilderness, and wildlife has also aided liberty by keeping alive the 19th century sense of adventure and awe with which our forefathers greeted the American West. Many laws protecting environmental quality have promoted liberty by securing property against the destructive trespass of pollution. 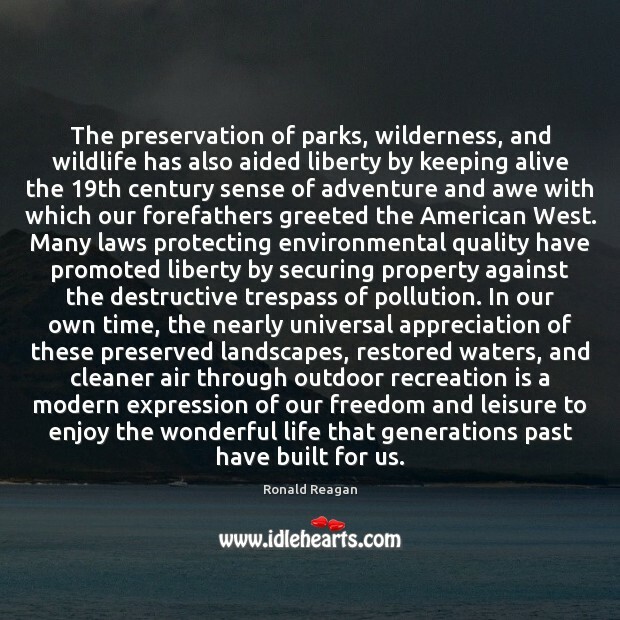 In our own time, the nearly universal appreciation of these preserved landscapes, restored waters, and cleaner air through outdoor recreation is a modern expression of our freedom and leisure to enjoy the wonderful life that generations past have built for us. The fire. 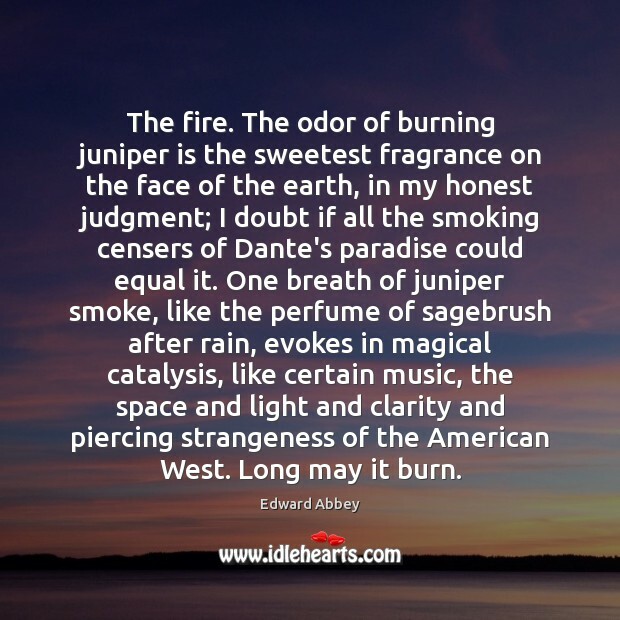 The odor of burning juniper is the sweetest fragrance on the face of the earth, in my honest judgment; I doubt if all the smoking censers of Dante's paradise could equal it. One breath of juniper smoke, like the perfume of sagebrush after rain, evokes in magical catalysis, like certain music, the space and light and clarity and piercing strangeness of the American West. Long may it burn. The American West is just arriving at the threshold of its greatness and growth. 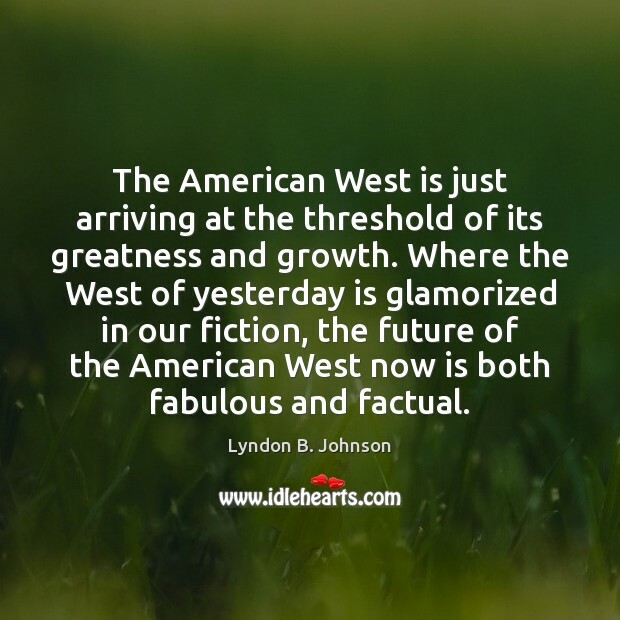 Where the West of yesterday is glamorized in our fiction, the future of the American West now is both fabulous and factual. 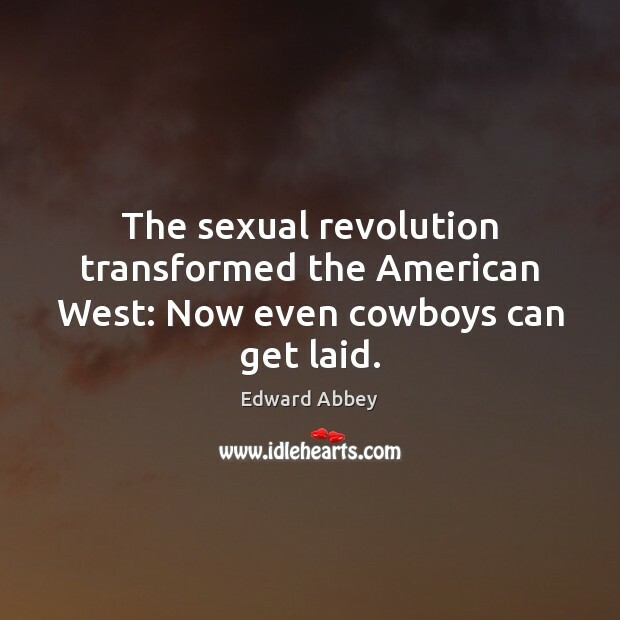 The sexual revolution transformed the American West: Now even cowboys can get laid. Well, we are Americans. 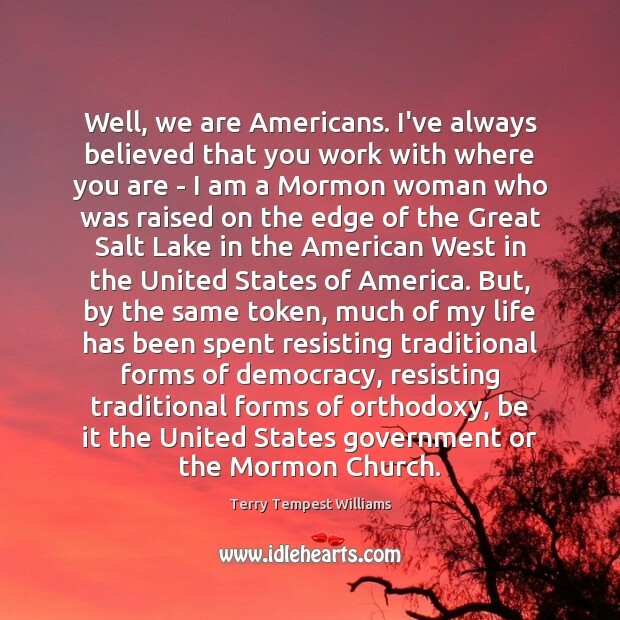 I've always believed that you work with where you are - I am a Mormon woman who was raised on the edge of the Great Salt Lake in the American West in the United States of America. But, by the same token, much of my life has been spent resisting traditional forms of democracy, resisting traditional forms of orthodoxy, be it the United States government or the Mormon Church. For decades, people have known the chemical-propulsion approach to space travel is really not going to get us that far. 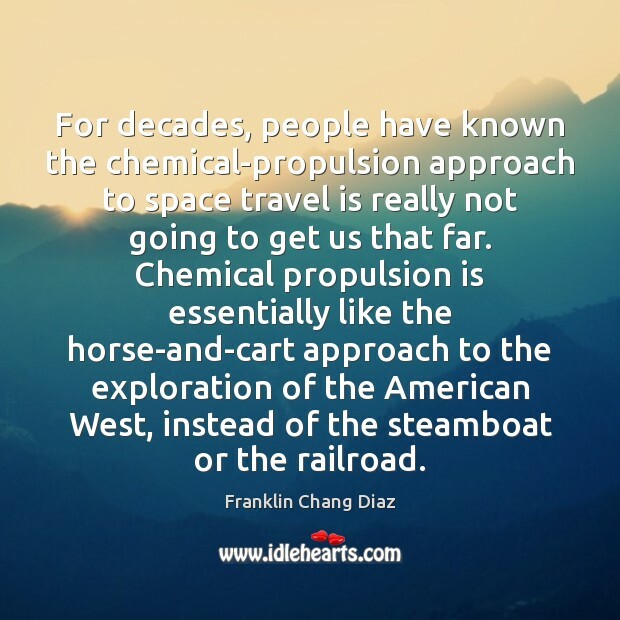 Chemical propulsion is essentially like the horse-and-cart approach to the exploration of the American West, instead of the steamboat or the railroad. 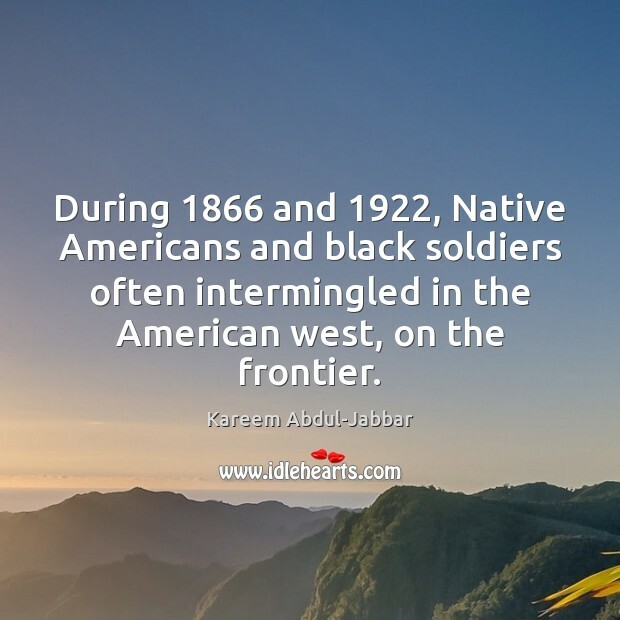 During 1866 and 1922, Native Americans and black soldiers often intermingled in the American west, on the frontier. 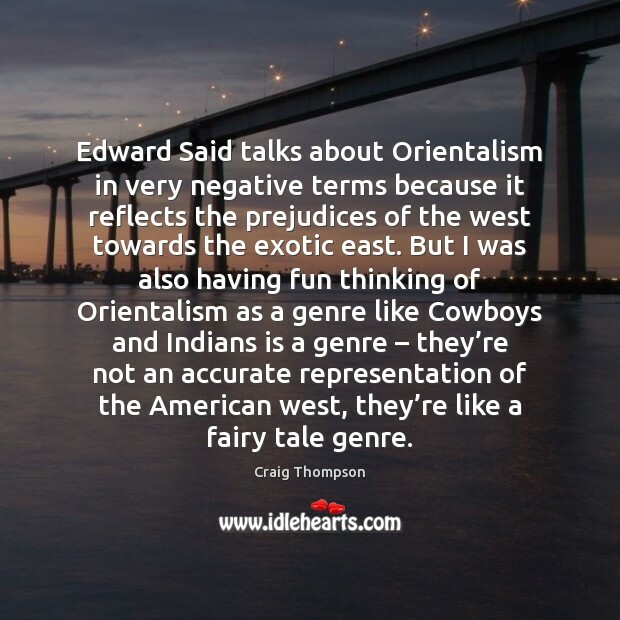 Edward Said talks about Orientalism in very negative terms because it reflects the prejudices of the west towards the exotic east. But I was also having fun thinking of Orientalism as a genre like Cowboys and Indians is a genre – they’re not an accurate representation of the American west, they’re like a fairy tale genre.